A successful and innovative partnership between the University of Stirling and University of Social Sciences and Humanities, Vietnam will see learning provision extended into a third city in the country this week. The new teaching base in Hanoi will be officially launched on Tuesday 17 November and marked with an inaugural lecture by Professor Matthew Hibberd on communicating climate change. 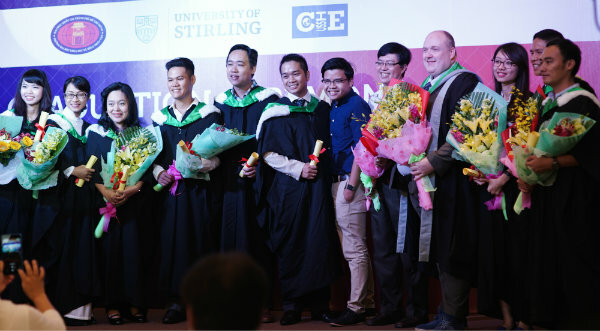 Eleven graduates from the University of Stirling were recently awarded their certificates at a ceremony in Ho Chi Minh attended by Professor Ngo Thi Phuong Lan, Vice President, University of Social Sciences and Humanities, HCMC, Vietnam and Professor Matthew Hibberd, Head of Communications, Media and Culture, University of Stirling. The collaboration has now seen more than 100 graduates of the popular MSc in Media and Communications Management in the Vietnamese cities of Danang and Ho Chi Minh. Following on from the success of the programme a further teaching base, in Vietnam’s capital Hanoi, will host the course from November 2015 with 12 students expected to graduate by June 2017. Launched in Danang in 2008 and Ho Chi Minh in 2010 the postgraduate courses, taught in partnership with the University of Social Sciences and Humanities in Vietnam, attract senior professionals working in the media and communications industries in Vietnam. Professor Matthew Hibberd, Head of Communications, Media and Culture at the University of Stirling said: “My congratulations go to this latest cohort of graduates, many of whom already operate at the highest levels of government, media and commerce in Vietnam, on their successful participation in our programme. It is testament to them, and our partners, that we are able to now expand our course provision to our latest centre in Hanoi. He continued: “The University of Stirling has always had a strong international focus and with a population of some 93 million with an average age of 30, the Vietnamese educational market is one in which we look forward to developing further. Students of the MSc in Media and Communications Management are educated using the ‘flying faculty’ method which sees lecturers from Stirling’s Communications, Media and Culture Division visiting six times a year for a week at a time to deliver intensive teaching. Guest lectures also take place from leading industry figures based in Vietnam and have included speakers from Google, L’Oréal and Prudential. The courses are affiliated by Vietnam National University.